It is not often that I can find some really plump Turkish figs, but when I do, I buy them. 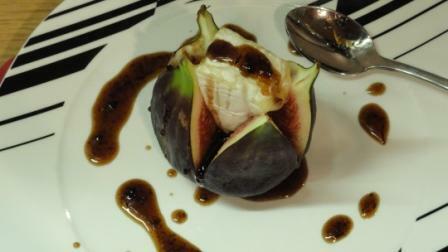 Figs can be paired with so many other flavours, but my best is certainly Camembert. This recipe is an extension of my previous one, adding some more sweetness with the honey. Lovely suggestion, going to try it. I bought my black figs (smaller than depicted above) in a large punnet at The Food Lovers Market (previously Fruit & Veg) for an eye-goggling R19.99 – I thought it was very cheap for the amount I got! That looks a right treat! It’s often a battle to find figs down here, apart from Woolies. Simple…delicious…and so easy to make. Yummy.